Filed to: Jane, stop this crazy thing!Filed to: Jane, stop this crazy thing! Jane, stop this crazy thing! What do you get when you combine a robot and a chair? 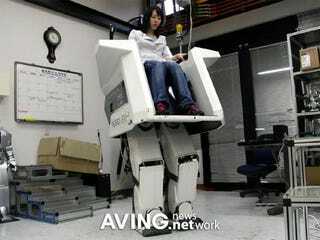 The Hubo FX-1 chairbot, of course. In what is perhaps my favorite robot design yet, this giant chair with legs looks like it came out of some ridiculous '80s sci-fi movie or something, but it's very, very real. It looks good so far, but what they really need to do is figure out how to get the legs folded up underneath so it can sit on the ground as a regular chair. Then, when your friend sits down, you hit a button on the remote control and suddenly he's 6 feet in the air and terrified on a walking chairbot. Awesome. Hit the jump for a video of the walking chairbot in action.